This French toast pound cake takes just minutes to fix, and it can be made with store-bought or homemade pound cake. I used this 2-egg pound cake recipe for my French toast (pictured). Without a doubt, a dense, buttery pound cake makes a fabulous dessert with or without fruit, berries, or dessert sauce. This French toast is yet another way to enjoy pound cake, and it is amazing. Drizzle a few tablespoons of warmed strawberry preserves over the pound cake French toast, or top the slices with berries and cream, caramel or butterscotch sauce, or your favorite maple or fruit syrup. The recipe is written for two thick slices for two people and it is very easy to scale up for 4, 6, or more people. In a wide, shallow bowl, combine the egg, milk, sugar, and cinnamon, if using, vanilla, and salt. Whisk until the mixture is smooth and well blended. In a large skillet over medium-low heat, melt the butter. Dip a slice of pound cake in the egg batter mixture, turning carefully to coat both sides. Don't let the cake soak for long or it could break down. Using a spatula, move the coated slice of pound cake to the skillet. Repeat with the remaining slice of cake. Let the pound cake slices cook for about 3 minutes, or until the bottoms are browned. Carefully turn each slice to brown the other side. 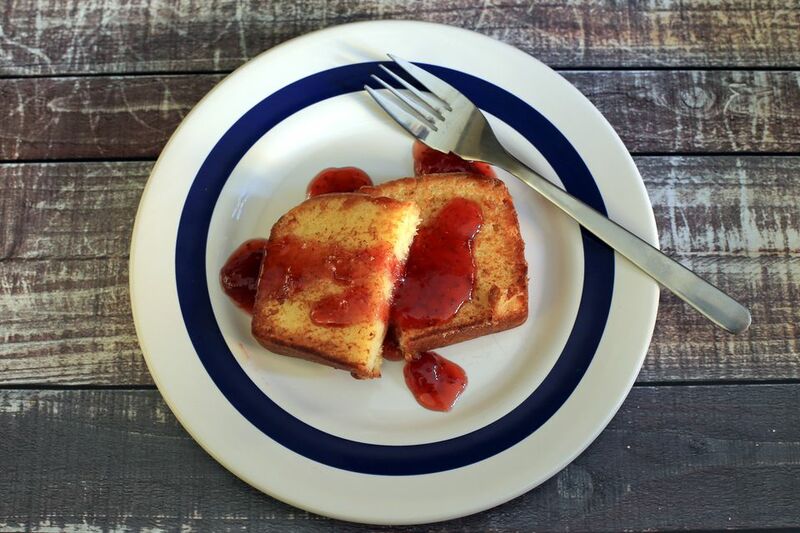 Serve pound cake French toast with warm preserves, syrup, fruit or berries, or a dessert sauce. Or simply sprinkle the slices with powdered sugar. Double or triple the recipe and freeze the extra pound cake French toast. Place the cooked French toast slices on a baking sheet and freeze until firm. Transfer to zip-close freezer bags and freeze for up to 2 months. Reheat in the skillet. Add a dash of nutmeg and replace the vanilla with rum flavoring for an eggnog flavored pound cake French toast.